The EliminInk tattoo removal system works much like the original tattooing process, but instead of ink, it uses a solution formulated to bond with the original tattoo ink that draws the ink to the skin’s surface. DermRenu, a scar inhibitor, is contained in the EliminInk product to help minimize or prevent scarring. DermRenu is also sent home with the client as part of the aftercare treatment to aid in the natural healing process. The treatment is very similar to being tattooed. However, we do apply topical anesthetic to numb the skin prior to treatment. A treatment takes around 30 minutes to cover a 2” x 2” tattoo (4 square inch area). 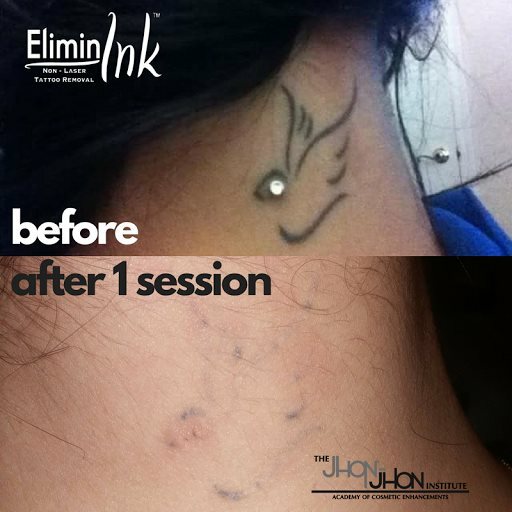 The most extraordinary thing about EliminInk is that you will actually get to see the results in just a few days. After the treatment, it must be kept dry for 48 hours during which a scab will form over the treated area. It is likely that parts of the tattoo will be almost completely erased on just the first treatment. Many tattoos require more than one treatment; however, the results are very impressive with EliminInk and a tattoo can be completely removed in just a matter of months, compared with the extended period of time one must dedicate to having a tattoo removed with a laser. I want to schedule an appointment! I would like to learn more!